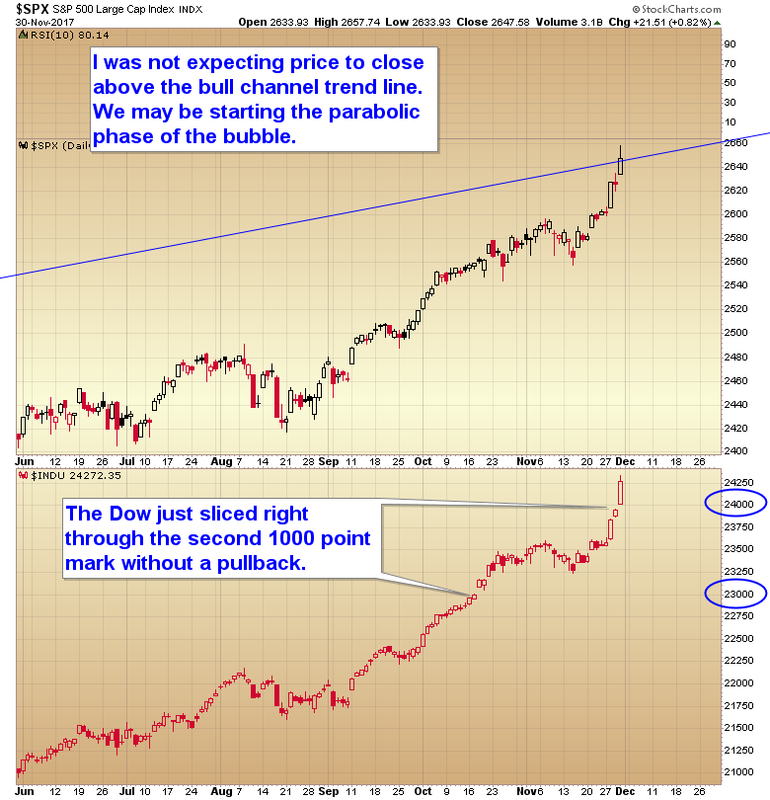 CHART OF THE DAY – PARABOLIC BEGINNING? This entry was posted in Uncategorized on November 30, 2017 by Gary. This has the potential to be a top, or it could just intensify the bubble mentality even more, making it even that much more likely that investors get caught when the top arrives. The more times the market recovers the more convinced traders become that there is no risk thus causing them to hold too long and get trapped when the final top does occur. This entry was posted in Uncategorized on November 29, 2017 by Gary. This entry was posted in Uncategorized on November 28, 2017 by Gary. This entry was posted in Uncategorized on November 27, 2017 by Gary. This entry was posted in Uncategorized on November 26, 2017 by Gary. Did we learn nothing from the tech bubble? Apparently not, as here we go again. The next series of bubbles is now in progress (Bitcoin is the first). Let me go over again the signs of a bubble. Price will usually rally at least 100% or more in a year or less. A clear sign of out of control human emotions. Price will stretch 40, 50, or even 100%+ above the long term mean (200 day moving average). 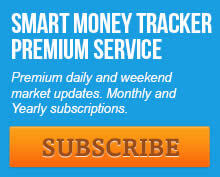 Investors will start to rationalize reasons for why this rise in price is justified. In 2000 investors convinced themselves that earnings didn’t matter. All that mattered was how many eyeballs your website was attracting. In 2006 investors convinced themselves that we were running out of available land in the world and skyrocketing real estate prices were justified. Apparently none of these people had bothered to take a look at the Mohave Desert. Land as far as the eye can see. In 2008 investors convinced themselves that we had reached peak oil, even though we had tankers sitting in the Gulf of Mexico unable to unload their oil because all of the storage facilities were full. Investors have now convinced themselves that the ability to counterfeit their own currency really is a viable strategy to get rich. And finally towards the end of a bubble you will get a massive insurgence of copycats trying to piggyback on the mania. During the final few months in 2000 there were literally thousands of websites coming online, none of which ever had even the remotest chance of making a dime. Here is a list of current Crypto currencies as more and more people try to piggyback on the mania. Again, classic behavior as a bubble nears its top. There is no barrier to entry in the cryptocurrency market and there is no fundamental difference between Bitcoin at $8,000 and bytecoin at less than a penny. It’s not like one has a superior business model and produces a more desirable product. In fact the inevitable massive dilution of the cryptocurrency market virtually guarantees that price will eventually go to zero. I’ve said this before, and I’ll say it again: Human nature never changes. At the very beginning of a bubble almost no one believes. The very few with the foresight to see what is coming are laughed at and branded as extremists. For almost a year now I’ve been telling investors that once the NASDAQ composite broke out above the 2000 highs we would see an aggressive rally and 10,000 would be a piece of cake, 20,000 wouldn’t be completely out of the question once we get into the nutty phase of the bubble. 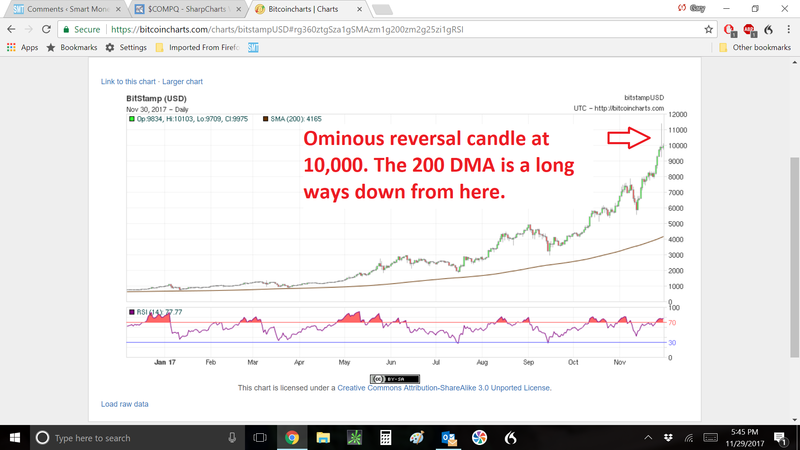 Most everyone laughed at me then, and many continue to laugh at me now even though the NASDAQ is doing exactly what I said it would do, it’s already almost halfway to 10,000 from the breakout above 5000. Four years ago I could’ve made that same statement about bitcoin. When bitcoin was under $1000 I could’ve predicted that we would see price go above $8000. I guarantee at the time everyone would’ve laughed at me, and thought I was insane. Now however, as price has continue to rise sentiment has swung 180° in the other direction, and no one can see any possible scenario where price could collapse. But I guarantee you price will collapse. Every parabolic move in history ends this way. This time is not going to be different. Let’s face it, anyone with a shred of common sense left can see that crypto currencies are a Ponzi scheme. Getting rich simply isn’t as easy as creating your own currency out of thin air and then watching as gullible investors bid the price up. That is a perfect example of the Greater Fool theory in action. The sad fact is most of the fools jump into a bubble towards the very end and then get caught when the market collapses. Did you get caught in the tech bubble? Did you get caught in the real estate bubble? Did you get caught in the energy bubble? If you answered yes to these three questions, and you are now buying bitcoin after it’s already rallied 700% in the last year, then you my friend are the Greater Fool. You are unable to learn from past mistakes. You are one of the sheep that drive bubbles. You buy too late, and you hold too long. The time to get into a market is before the parabolic phase begins, not after it’s already rallied 700%. I don’t believe bitcoin is going to be the only bubble. We are going to have a bubble in the stock market, and I expect we will probably have a bubble in the gold market after that. Many, many Greater Fools are now piling into the bitcoin market. Those very few that can still think logically recognize that it’s too late to jump into the bitcoin bubble. 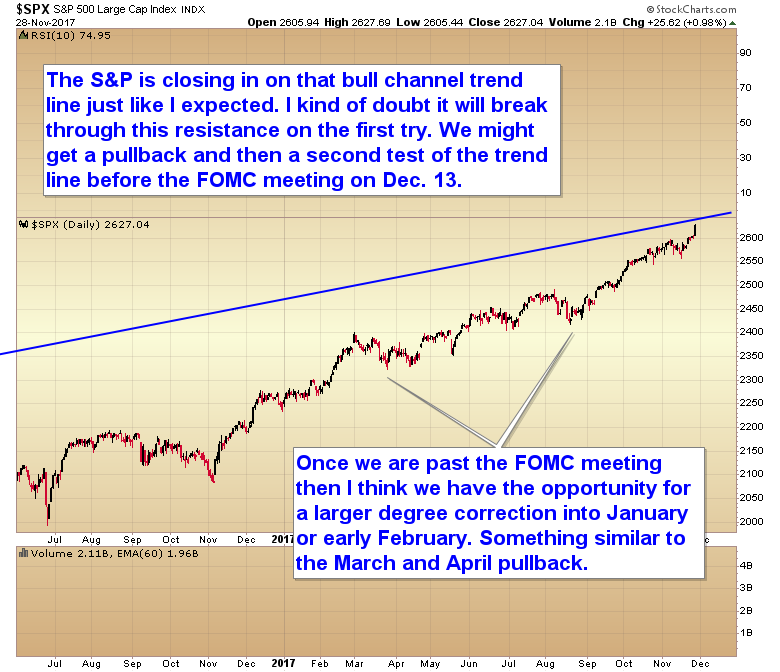 Those with foresight can see the next bubble is just now beginning in the stock market. If you want to ride a bubble you need to get in early. I’ve posted the Robo ratio a couple of times in past articles. 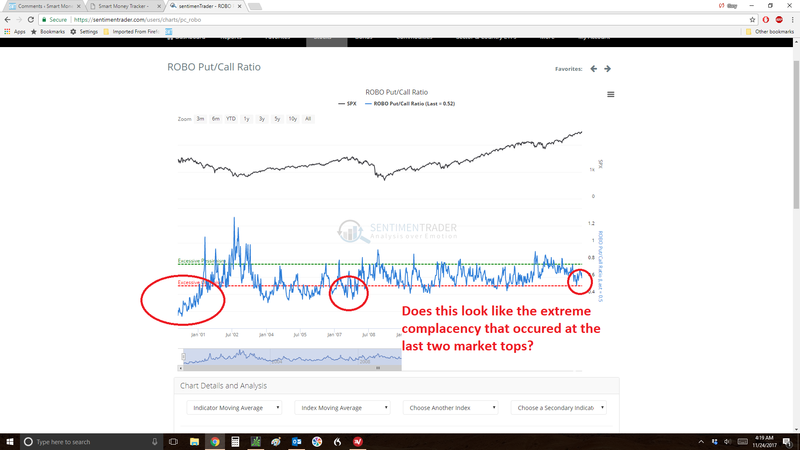 It is one of the best, if not the best single sentiment tool to judge complacency in retail investors. The Robo ratio still isn’t even vaguely close to conditions that exist at final bull market tops, much less at a bubble top. Folks if you want to profit from a bubble, you have to get in early when everyone else is still in denial. Despite doing exactly what I predicted it was going to do, most traders still view every pullback In the stock market as the beginning of a crash, instead of a buying opportunity. At some point price will go up far enough that traders will lose all fear and every pullback will be viewed as a buying opportunity just like they view pullbacks in bitcoin right now. When we get to that point it will be close to the top and time to start thinking about selling your stock market positions. If you got caught in the tech bubble, real estate bubble, or energy bubble maybe it’s time to exit the Greater Fool bandwagon and do something different this time. Maybe it’s time to buy at the beginning of a bubble instead of the end. 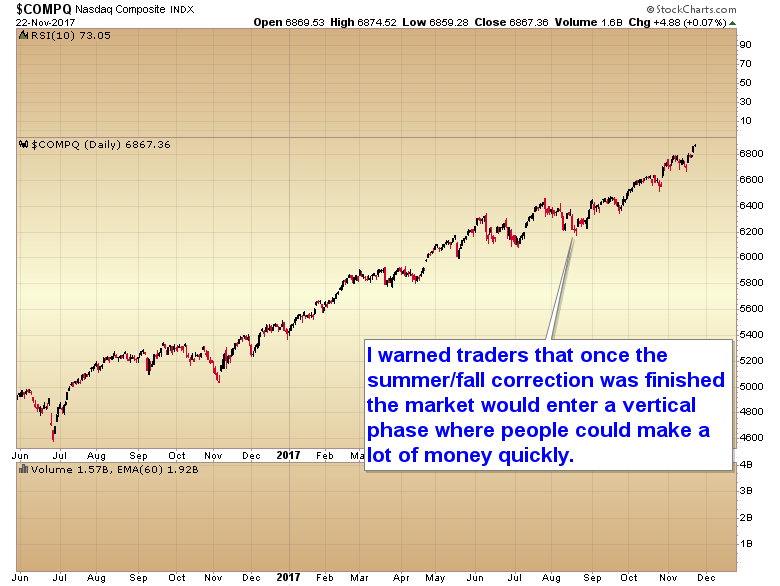 I warned people that once the summer/fall correction was complete the markets would begin a vertical phase and traders would make a lot of money quickly. Most ignored me and missed the opportunity, while they waited in vain for the September/October crash that I knew was never going to come this year. This is just the very beginning of the bubble. You can either continue to wait and buy at the top just like you did during the tech bubble, real estate bubble, and energy bubble, or you can try something different and buy at the beginning of the bubble this time. Possibly the last great buying opportunity before the bubble shifts into a higher gear. This entry was posted in Uncategorized on November 23, 2017 by Gary. This entry was posted in Uncategorized on November 22, 2017 by Gary. This entry was posted in Uncategorized on November 21, 2017 by Gary. This entry was posted in Uncategorized on November 19, 2017 by Gary. This entry was posted in Uncategorized on November 18, 2017 by Gary.